When my daughter and her husband decided they were going to decorate their nursery with a Dr. Seuss theme, I figured that Dr. Seuss would make a perfect theme for the baby shower I was planning on throwing. Picking a theme for a baby shower makes planning everything so much easier and there are so many options to choose from with a Dr. Seuss baby shower I just couldn't resist! Of course, as a craft lover and avid DIYer, I planned on making as many of the baby shower decorations, games, and other supplies as possible. Of course, I had to come up with a Seuss related baby shower invitation. I found a lot of great inspiration online. There are so many creative ways you can decorate for this fun shower theme it was hard to naoorw it down to a manageable number of options! No baby shower would be complete with out games. I planned 3 games and a couple of other things each guest could do. Not homemade, but so cute I just wanted to share a picture of it! I made this corsage, for the mom-to-be to wear, using a tiny Cat-In-The-Hat finger puppet and some ribbon! I made these for the nursery, not for the baby shower, but I thought I would share it here since it has a Seuss theme! Again, I didn't make this for the shower, just for the nursery. Although, if we could have hung stuff up at the restaurant it would have been fun to use these! 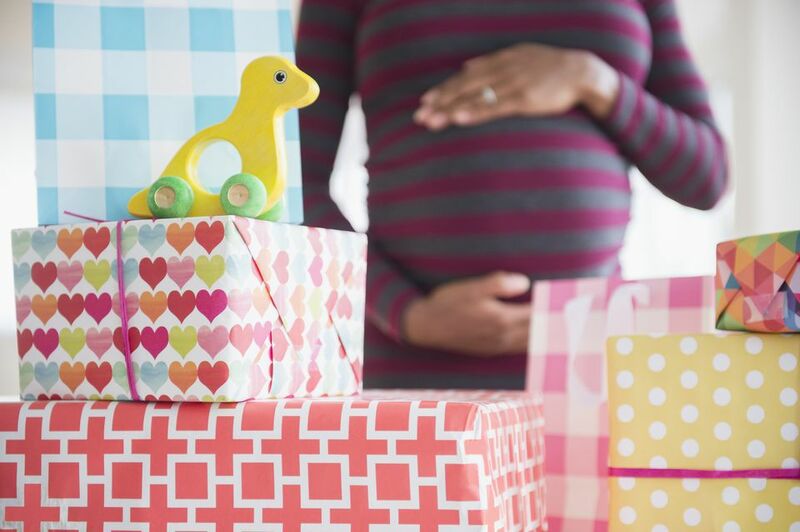 I hope these ideas help you plan your own baby shower. If you have any fun baby shower ideas, submit them to be published. You can be one of the first to know when new craft projects are posted by taking a few moments to sign up for the Family Crafts Newsletter and you can also chat about crafts with others in the Family Crafts Forum. I started out working on an invitation and other baby shower basics. I wanted a fun and unique Dr. Seuss themed baby shower invitation so I went to one of the sites that always inspires my creativity... Etsy! I did a search for Seuss Baby Shower Invitations, took some notes, found some Dr. Seuss clip art, and sat down with my Paint Shop Pro (compare prices) to create one. We had the baby shower in the party room at a restaurant so there was not a lot of decorating we could do. 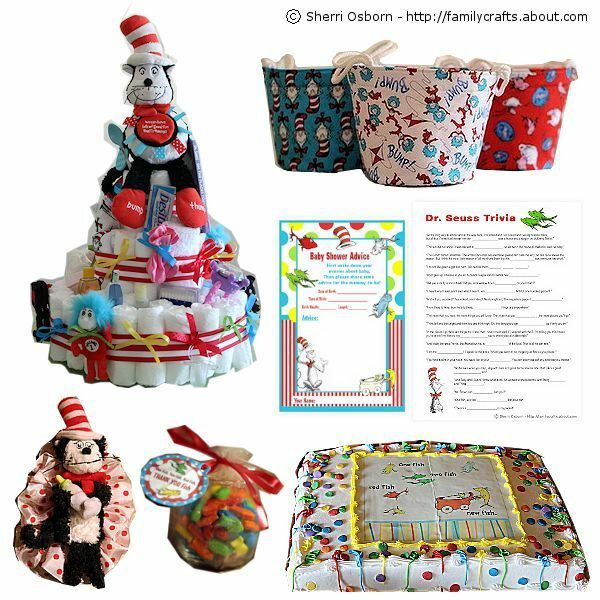 I ordered Dr. Seuss related table clothes, plates, and napkins (Compare Prices). I also ordered Dr. Seuss baby shower themed thank you cards and some Dr. Seuss cut-outs (compare prices). There were two different kinds of cut-outs: one of the designs featured different colored fish and the other looked like the Cat-In-The-Hat's hat. We scattered the fish around the room and the we actually used the back of the hats for one of the baby shower games. These miniature fish bowls were a huge hit and they really dressed up the tables! They were very easy to make and all of the party guests were very excited to be able to take one home with them. Diaper cakes are popular baby shower gifts. I made one using a variety of Dr. Seuss related items plus several other baby supplies. Not only did my daughter appreciate the gift of getting all of the baby items (and the 80 diapers! ), this project doubled as a fun decoration, and tripled as a baby shower game! I made these buckets using this Make Life Fun Pattern by Sweetwater. I actually made them for my daughter to use for storage in my granddaughter's room, but we brought them along to the baby shower and used placed one in the center of each table to dress them up and to use to collect advice cards and thank you card envelopes. When guests arrived at the shower, they found each place set with not only a fish bowl party favor, but also with some items they needed for playing games along with an advice card and a blank thank you card envelope. They were asked to write their name and mailing address on the front of the envelope and the envelopes were placed in the Dr. Seuss Buckets along with the filled-in advice cards. Once all of the games were over, we drew envelopes out of the buckets and gave away the last couple of prizes. Everyone was given one of these at the beginning of the shower. Not only were they asked to write a word of advice, but there were also spots for them to guess the date of birth, time of birth, weight, and length of the baby. I found some wonderful sources of Dr. Seuss trivia online and compiled a list of lines from a variety of books. I omitted one word from the line and the baby shower guests needed to guess the word and fill in the blank. I thought this game would be a little easier than what it turned out to be, but everyone enjoyed it. While I was searching for ideas for baby shower games, I came across this unique game. IN a nutshell, there are 12 game cards featuring ultrasound pictures of different baby body parts and guests have to try to guess each part. This game also came with 25 word lists/answer pages. As I mentioned previously, I made a diaper cake to not only serve as a decoration, but also as a game. The diaper cake was displayed at the gift table for all to see until it was time to play this game. I then covered the cake with a receiving blanket and everyone had to try to write down all 30 baby related items that could be found on the diaper cake. I brought a dozen small prizes to give to that game winners. I placed each prize in a red, paper lunch bag. I printed out some small graphics of different Dr. Seuss characters, cut them out, and then used Glue Dots (compare prices) to attach one to each bag. One of the items that I did not make for the baby shower was the cake. I put my mom in charge of the baby shower cake and wasn't disappointed. She took one of the Dr. Seuss napkins I bought to the Coborn's bakery and they were able to reproduce it on top of a cake.